The earring? I told my jeweler today, "$112 is too much. Just stick a rock in there. Any old rock. Go out in the alley and find a rock. I mean, keep the amethyst in the one earring. Fix up the other one so I can wear them, they don't have to match." He laughed and said, "ok."
Went to a Reiki class tonight. There were 15 eager students. It was a lovely night, peaceful. We went around and around the circle, talking about Reiki, cancer, yoga, Mikao Usui, Reiki principles, cancer, self-care, Reiki with dogs, and self-Reiki. Gosh, I love to talk about Reiki. We spent lots of time talking and kind of ran out of time to actually do Reiki. oops. Anyway, we talked, meditated, did Reiki on each other, and then did attunements. I attuned all 15; everyone wanted to be attuned! Even the master in the crowd. I asked the master to attune me. "I don't attune like you do," she said. "That's OK, do it however you do. That's fine," I responded. I sat up straight and tall with my hands in Gassho, pressing the bases of my palms together tightly. She waved one hand over my head and shook a little. "Oh! You take on a lot. Release all that energy that doesn't belong to you," she commanded. I closed my eyes. I started to cave-breathe; long deep breaths from the bottom of my throat. I waited for her to start. I couldn't feel her touching me at all. Suddenly I stopped breathing, grinned, and turned my face to the sky. My eyes were still closed. I sat like that, and waited for her to touch my head, shoulders, and hands. I waited. I could hear her breathing, loud uneven breaths. Then she knelt and put her hands on my feet. Then she laughed and said she was done. I opened my eyes. "I started, and you had SO much energy!" she said. "So I started, but there were angels all around you. They told me to step back. They said they would do it." She laughed again. I thanked her and the four angels I sensed above and around me. Thank you. Not on my "Blood Type" diet. Bananas? No thanks. The texture. Made a pallet garden this weekend. I realized the whole garden was planted and no zucchini. So I made a new garden. I had 3 pallets stacked up against the fence, leftover from cinder block delivery. I used cinder blocks to build 3 raised beds. I spread gardening fabric on the lawn. Yeah, you're supposed to remove the grass. I didn't. Flipped the 3 pallets over onto the fabric. Spread another layer of fabric (white side down). Then I filled the gaps with soil. I let the soil rest and settle for a day. Then rain was predicted for the next several days, so I planted. Zucchini and summer squash. Hoping for a great crop. Fluff & I swam in the river today. The stony beach was hot, the water icy cold. Maple seed helicopters swirled in the air and water. The stones were eggs of granite: pink, white, and grey. Milky quartz. Something green. It was so hot, I brought Fluff into the water even though she is morally opposed to being wet. The frigid water cooled her. She snoozed in the shade of my chair as I read Rolling Stone. A woman came to train her dogs. She brought a short-haired pointer named "Grace." I know, because she shouted "Grace" frequently. She also brought a young puppy. Both dogs were tightly monitored and constantly reprimanded. The woman wore long pants and shirt, and had a peculiar backpack. Evidently it stored the tools of her training, as she kept reaching into it. She let the pup of his/her leash and it came over to see Fluff. The woman instantly retrieved and scolded the pup. Other than that, Fluff & I were alone at the river. Just us, the stones, and the icy water. Met this woman, she was having a hard day, and, well, she needed some books to read. We met in a restaurant. Friend of a friend, she showed us her workplace. We skipped up three flights of stairs. At the bottom was a faded painted sign. The stairs were wide, wood, polished and clean. The ceilings were high, the space pulled me up. We got to the top and removed our shoes. The floors were old, stripped and sealed anew. We saw the yoga space, the dark massage room with loft, and then the common room. Yeah, the common room? The wooden floor, red oriental rug, big couch, plants, ... but the windows. The ceiling was 15 or 20 feet high, and the windows tabletop to ceiling with wide arches at the top, surrounded by layers and rings of woodwork. Sun poured in. Views of rooftops, trees, buildings, and parking garages. Trees and the river? Not sure. The practitioners are dedicated to joy. Life Ideals. Check it out. Went to dinner with current and recent co-workers. It was a night of ribald humor, texting around the table, tearful toasts, and unbuttoned affection. I had salmon and broccoli, wine, and chocolate cake. Actually brought most of the salmon home as filled up on broccoli. It was perfectly prepared: steamed al dente. Delish. We were a party of 22. We laughed and yelled around the table. Applauded all arrivals. Gathered for pics. Switched seats, mingled, and switched again. Three of our party are headed in new directions. They are loved and will be missed. Change is often difficult, full of lessons, and eventually ultimately beneficial. Best wishes to you, dear reader, if you are experiencing change. Be easy on yourself. Rest. Breathe. Lean on your friends (Chodron). And read Pema Chodron: When Things Fall Apart. Great book. So the earring. Do I pay the big bucks to replace the stone? Original price around $25. Then accidentally tossed one down the bathroom sink. (note to self, get a thing to block up the pipe. a... metal pop-up thing). Plumber w snake ruined earring while graciously retrieving. Snagged the silver but lost the stone. Jeweler wants $112 to replace the stone. Geez a lou. How about a piece of glass? Have you read her books? Am reading Some Assembly Required right now. 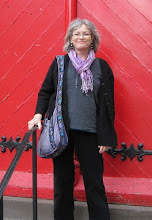 Very cool, spiritual seeker, San Francisco, single mom and grandma. Highly recommend. And thank you, Karen K for telling me about Anne Lamott. It's been a plethora of emotion. Not enough insight. Am reforming. So I went to a big event this evening. Held at a posh hotel with a gorgeous view of the falls, the mill, and the Lewiston skyline. Lots of great people there: warm, loving, hearts-wide-open people. Social event: eek. Not my strength. Luckily T asked me to sell my books, so yeah, had a table and a job. I can do that. I talked to everyone who wandered by. "Hello! I'm selling these books to raise money for services for people with cancer and their caregivers. 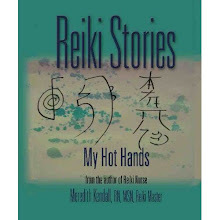 These books are about Reiki and nursing. Do you know what Reiki is? No? Well it's like this..."
I gave away a lot of bookmarks. I had to speak to the crowd, on a microphone. People snapped pics. geez louise. Then I sold some books, yay! I raised money for people with cancer and their caregivers. Now they can receive free Reiki sessions. Sharing Reiki, spreading the light. Remember that earring that went down the drain? Yeah. Liked those earrings, wore them a lot. Big amethysts set in silver. Paid a lot for them, like $30. Remember how the plumber snagged the silver but lost the amethyst stone? So I took the earring and a half to my jeweler. He's a great guy. Asked him to pop a stone in there and call me when it was done. Got a call today. "Yeah, that's going to be $112 for the stone? You want us to go ahead?" I brought him some whoopie pies this evening, to thank him. Thank you, neighbor. My boss asked for volunteers. I volunteered. "The flower bed outside looks terrible. Who volunteers to clean it up and plant some flowers?" So today I went out with my favorite weed-digging tool. I noticed a man with a weed whacker, trimming the grass along the side of the building. I started to dig dandelions out of the flower bed. I put them into a plastic bag, intending to toss them in the trash. The dandelions were big and the bag was filling up fast. The man came over. He looked at the dandelions in the bag. "Are you going to eat those?" he asked me. "Are you going to make wine?" he asked. "Well what are you doing?" Did he think I was some random person off the street, harvesting dandelions? I looked up at him. "I work here. I'm weeding this flower bed. We're going to plant flowers." "Oh. I was going to tell you not to eat them. They sprayed this lawn two weeks ago. You shouldn't eat them." I got to thinking about that earring in the drain. A piece of gum on a long stick. no. How about if I hot-glue a magnet to a dowel and stick the dowel down the hole and catch that earring? I tried a magnet to the matching earring. Didn't stick; not magnetic; no go. I went to work another day. Maybe a big chain. If I drop a big chain down the drain, it will fall down and knock the earring with it and I will catch it in the basin. I don't have a big chain. I could buy one. Maybe I could see it with a flashlight and I could fish it out with a fish hook. I don't have a fish hook. Or a paper clip. I went home and looked with a flashlight; I couldn't see it. I stuffed a rope down the drain, I poked it with a flexible piece of plastic. Nothing. There must be a tool. I can't be the only one in the world to drop something down a drain. My neighbor is a plumber. I grabbed an umbrella and set out. I looked thru the window. The plumber was watching TV with his wife. I knocked. No answer. I looked again, 2 TVs, and the plumber was wearing headphones to hear his show. I knocked on the window and he came to the door. He tried a wire, no good, but snagged the earring with a plumber's snake. "Was there supposed to be something in it?" he asked, holding out the silver circle. The amethyst was gone. "That's ok," I said. "I can get another stone. I can get it fixed. Thank you!" I should get something to cover that bare hole. Some kind of stopper. I should buy him a cake, or bring him some spinach from my garden; he wouldn't take any money. "Neighborly thing to do," he muttered as he wound up his snake. That's it. That's the story. No stoned caterpillars or Mad Hatters. I used a wrench, I opened a trap, and I talked to my neighbor. That's the adventure of the earring in the drain. Had a wrenching experience today. Getting ready for work this morning I was rushing around and accidentally tossed an earring into the bathroom sink. Right down the drain. Isn't there supposed to be something in there to block earrings and stuff? Yeah, mine is just a hole into the pipe. One of my favorite earrings. A lozenge of amethyst, purple like a glowing grape. Surrounded in a thick ring of silver. Expensive. Favorite. I dashed off to work, expecting a very bad day. We were told a month ago that there will be layoffs and cutbacks. Some of us thought today was the day. It wasn't. It was the day I threw an earring down the drain and spilled blueberry juice on a new shirt. I asked a co-worker what to do about the earring. "Did you turn off the water right away?" he asked. "Yes. Wait. It wasn't on," I replied. He told me to use an adjustable wrench to remove the bottom of the trap. I went to the Paris Farmer's Union and looked at wrenches and traps. I found a big adjustable wrench that would fit a trap, $12. I also purchased some potatoes to plant, and a tarp ($20) and bungee cords (10 @ $1.35 each) for my deck canopy. The old one was shredded in the hurricane last fall. Back home I put on a stained old T-shirt. I got a step stool, a basin, and my new wrench. The trap to the bathroom sink is just below the basement ceiling. The trap came off easily. There was a little sand in the bottom, no earring. I left the basin below the pipe and ran upstairs to run some water, hoping the earring was trapped in the pipe and would be dislodged by water and would be flushed into the basin. I ran upstairs and down many times. 10? I turned the faucet on and off, ran down to check the basin: repeat. Failure. No earring. Where is it? Trapped in the elbow of a pipe? Oh well. I used a wrench.